Sharp-shinned Hawk (Accipiter striatus) is also called "sharpie", the smallest hawk in North America. 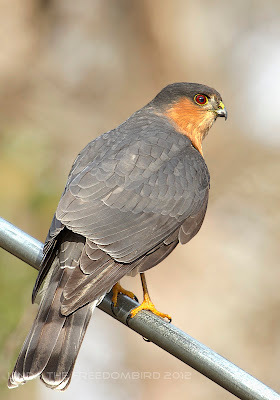 They, like another similar larger hawk, Cooper's Hawk, mainly hunt birds for food. My backyard is a bird's heaven full of cardinals, chickadees, titmice, doves and many other birds. But it also becomes a Colosseum between birds and few hawks. Sharp-shinned Hawk, like most of hawks, females are much larger than males. Mature adults have red eyes and a dark cape is connected to the nape and leads down to the back like in this picture (thanks James Fleullan to point this out). I snapped this one while I was shooting few sleeping Mourning Doves. It was a quiet, sunny afternoon, there were 6 doves napping on a Tulip Poplar tree. After taking few shots, one dove suddenly flapped its wings and flew off...Immediately I sensed here must be a hawk near by. So I patiently waited and did not want to make any movement. Within few seconds, the rest of doves seemed to sense the danger signals sent by their watch guard, they all woke up and took off. As doves flew away, this hawk silently landed on the same spot where doves were. Wow, super excited, I quickly snapped few shots. Hawk investigated his surrounding, ignored my presence and he came closer. "He must be hungry", I thought. A glimpse from his fierce red eye caught my full attention and I just understood how beautiful this hawk was. nice shots, i love it ... ..the plumage is nicely sharpen but becareful the tail a bit too details. Thumbs up photo!!!! That is a great shot! I'm sure I've told you that we have Cooper's Hawk that comes to reside in our backyard every year. They are beautiful creatures!